Srini uses advanced brain research to unlock the miraculous potential of ordinary people. No one with these kind of credentials and experience can make complex science so engaging and entertaining. If your goal is to electrify an audience—whether on-the-air, online, or in-person—it’s hard to find a better guest than Srini Pillay. 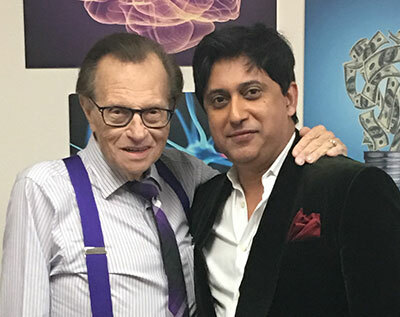 While his unique sartorial flair catches people’s attention and announces his unrepressed joie de vivre, the minute he begins speaking, Srini’s brilliance, insight, compassion, and humor bring “big ideas” to life for both non-specialists and medical professionals alike. He wins over even the most hard-bitten skeptics in minutes, simultaneously entertaining, enlivening, and delighting his audiences. Our ‘Neuro-Doc Rock Star.’ A mad scientist complete with a crazy haircut who gets a huge response from our audiences. You understand from the first minute—this guy is brilliant! Dr. Pillay has presented the Brain Science materials in such an encouraging and exciting way! I know as I continue taking the personal "Actions," my new directions will bear much fruit! The brain’s no longer a ‘black box.’ Srini helps us better understand why we act and re-act as we do. He is a master communicator with a very winning style.